"Call upon Me in the day of trouble; I will deliver you, and you shall glorify Me" (Psalm 50:15). "The Lord also will be a refuge for the oppressed, A refuge in times of trouble. And those who know Your name will put their trust in You; For You, Lord, have not forsaken those who seek You" (Psalm 9:9-10). "The Lord is good, A stronghold in the day of trouble; And He knows those who trust in Him" (Nahum 1:7). "For in the time of trouble He shall hide me in His pavilion; In the secret place of His tabernacle He shall hide me; He shall set me high upon a rock" (Psalm 27:5). "You are my hiding place; You shall preserve me from trouble; You shall surround me with songs of deliverance" (Psalm 32:7). "This poor man cried out, and the Lord heard him, And saved him out of all his troubles" (Psalm 34:6). "The righteous cry out, and the Lord hears, And delivers them out of all their troubles" (Psalm 34:17). "But the salvation of the righteous is from the Lord; He is their strength in the time of trouble" (Psalm 37:39). "God is our refuge and strength, A very present help in trouble. Therefore we will not fear, Even though the earth be removed, And though the mountains be carried into the midst of the sea; Though its waters roar and be troubled, Though the mountains shake with its swelling" (Psalm 46:1-3). "You, who have shown me great and severe troubles, Shall revive me again, And bring me up again from the depths of the earth" (Psalm 71:20). 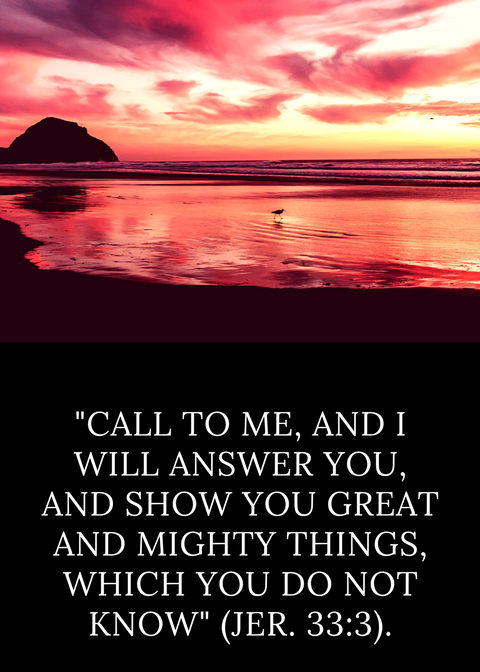 "In the day of my trouble I will call upon You, For You will answer me" (Psalm 86:7). "He shall call upon Me, and I will answer him; I will be with him in trouble; I will deliver him and honor him. With long life I will satisfy him, And show him My salvation" (Psalm 91:15-16). "Then they cried out to the Lord in their trouble, And He delivered them out of their distresses" (Psalm 107:6). "Though I walk in the midst of trouble, You will revive me; You will stretch out Your hand Against the wrath of my enemies, And Your right hand will save me" (Psalm 138:7). "Give us help from trouble, For the help of man is useless" (Psalm 60:11).